Put the seeds into a zip lock bag, squirt some paint on the seeds and mix the paint around until all seeds are covered in paint. Do this for as many colors as you need/want. Spread the seeds out on wax paper and let dry. While they are waiting for the seeds to dry, your child can draw a picture onto his/her poster paper. Some ideas include masks, fish or wild designs. Remind your child to keep it simple, remember, they will be “coloring in” with seeds. You can always use dried beans, lentils, popcorn or other types of seeds for this project, you don’t need to use pumpkin seeds. In fact, if you use dried beans, you can leave them in their natural colorful state (black eyed peas, red kidney beans etc). Lay out some of your newspaper to protect your table. Stuff your paper lunch bags w/ newspaper. I recommend that you ball up ONE piece at a time of newspaper. It will fill your bag faster and it will look nicer. Once your bag is full close the bag off w/ a rubber band. Next you are going to paint the paper bag from the rubber band down orange and from the rubber band up (should only be a small bit) green for the stem. Repeat this until you have all the pumpkins you want in your patch. Once all the paint is dry, take your paper ribbon as seen above and wrap it around the tops of the pumpkins you will have one long vine if you wrap and move to the next and wrap it around. This will give you the pumpkin patch look. Additional if you feel like it. Take fun foam and cut out leaf shapes and add them to your vine w/ tape. Glue will not keep them due to the weight of it along w/ the paper ribbons texture. Summary: A fanciful story about a man’s love for a field and the crop of bright, orange, bumpy pumpkins that he cultivates and sells to save it. A story time favorite that really speaks to one’s imagination and is sure to capture yours. Summary: A squirrel, a duck, and a cat happily cook and coexist ‘deep in the woods in an old white cabin’ until the duck starts to question things. things like why does he always have to add the salt to the soup, but he never gets to stir. Beautiful illustrations add to this original tale of friendship, sharing, and oh yes pumpkin soup. There is a great recipe in the back of the book. Summary: Visit Comstock Farm with a little girl and her parents to pick apples, pumpkins, and enjoy some delicious apple cider. A perfect choice for a Fall story-time that all your listeners are sure to enjoy. Measure out and place one cup of vanilla pudding into bowl. Next, add 2 teaspoons pie mix to the bowl. Mix well and enjoy! 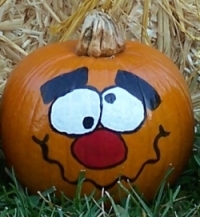 Purchase a Pumpkin, have your child use a sharpie marker to draw a face on it. Talk about the bumps in the pumpkin and the stem. Talk about what a face is made up of, eyes, nose, mouth could even include ears. Once this is done, use that same pumpkin to carve up. You can continue to use this pumpkin either for display or you can continue to carve it up and steam the pieces. Once you steam them you can peel the skin off and use the pumpkin for recipes. Save the seeds to make toasted pumpkin seeds.